London is a global city that has brought people together from all over the world for centuries. It’s a bustling place that welcomes millions of tourists every year who come to absorb the architectural delights, old and new, that line the city’s tight winding streets. In the past we have referenced many buildings looking at how they have made a mark on the city and wondered how they will impact its future. The buildings we usually focus on tend to be those of a grand scale like The Shard or The Walkie Talkie. However, this week, we are shifting our attentions to a new compact building that is leading the way in achieving a sustainable future for the city on a smaller scale. The City of London Information Centre that sits just in front of St Pauls Cathedral and was opened to provide visitors and tourists all the answers they need when they are trying to navigate the city. The design of this building is rooted in energy-efficiency with the buildings designer – Make Architects – taking all of the measures necessary to ensure that the building exceeded Part L of current Building Regulations C0² targets by twenty per cent. In order to achieve this, the building has been created using a variety of energy saving materials such as energy-efficient glass, a highly insulated building envelope and a highly sustainable geothermal heating system. The beauty of the building is that it demonstrates how a brand new energy-efficient building can stand amongst historic structures without overshadowing the beauty of them. 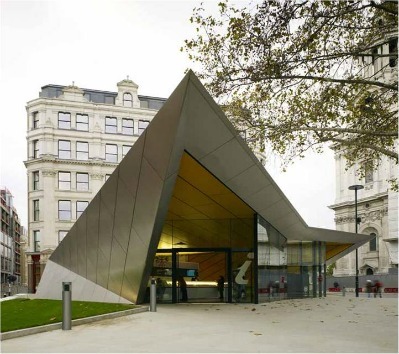 Here at Pilkington Building Products we are keen to encourage consumers to think about the energy-efficiency of their own homes and draw inspiration from new buildings like the City of London Information Centre. Working alongside architect George Clarke we have developed a simple list of measures that people can follow to ensure that their homes meet green standards set by the government. These energy saving tips include a variety of actions from the fitting of energy-saving light bulbs to reducing the temperature of your central heating by one degree, ensuring your central heating thermostate is not set above 19°C , to installing energy-efficient glazing like Pilkington energiKare™. All of our tips are simple and can be implemented over a period of time and once they have been applied to a home they will help to improve its energy rating and help to reduce the cost of both your heating and electricity bills. Further information on how to improve the energy rating of your home can be found on the House to Home website here.